In the golden desert of Namibia on the way to the famous Etosha National Park, one finds the Rare and Endangered Species Trust (Rest), which has grabbed the attention of the media, including giants such as National Geographic, Animal Planet and BBC, with its successful pangolin conservation work. Rest, which was founded in 2000 by Maria Diekmann, aims to protect rare and endangered species that have been largely overlooked and forgotten by the rest of the world, with its most recent success being the conservation of the Cape Pangolin. “We are one of the only trusts to have witnessed a pangolin being born into captivity and having survived,” Diekmann said. The pangolin, which was named Katiti, allows Diekmann to follow him as he forages for up to five hours in the wild, hunting ant colonies and using his snake-like tongue to consume up to 200,000 ants and termites a day. 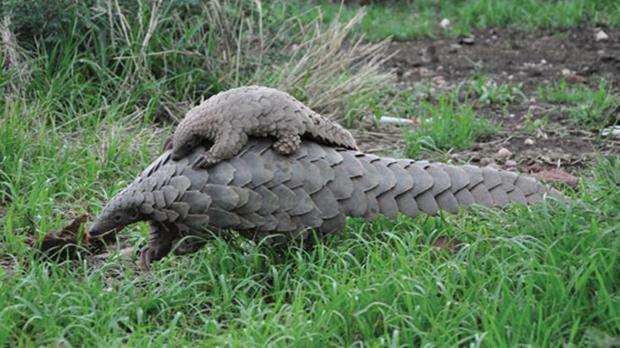 “This has been groundbreaking in the pangolin world as it has allowed us here at Rest to learn about these largely elusive and mysterious animals, which many people today do not even know exist,” Diekmann added. Rest receives up to 15 pangolins a year from police or environmental conservationists who would have saved them from being sold on the black market. Sadly, pangolins have today become the most trafficked mammals in the world as their scales – made solely of keratin, like human nails and hair – and blood is used in Chinese medicine due to the unfounded belief that it can help cure cancer and other ailments. Their meat is seen as a delicacy in countries like China and Vietnam and their scales are also crushed into a powder and used as a recreational drug by being sniffed like cocaine. Given its exorbitant price it is seen as a status symbol. Katiti on the back of her mother, Roxy. Injured and usually starved pangolins are taken into pangolin rehabilitation centres to heal before being released back into the wild. However, more often than not they never make it very far as they quickly die due to a combination of being weak, a change in environment and not being able to hold stress very well. At Rest, however, Katiti – the pangolin born in captivity – manages to calm down injured and weak pangolins, enabling them to feel comfortable and heal in this unknown environment. “Rest always tries to fit most of its pangolins with transmitters before they are released back into the wild as this will help us continue learning more about these mammals and to monitor them closely, hopefully helping to once again restore the pangolin population which is quickly diminishing,” Diekmann said. However, with this success story comes a very sad reality, as Rest has suddenly become homeless. It entered into a purchase agreement five years ago for 300 hectares outside the game fence of Otjiwa Game Lodge in Namibia; however the lessee is now trying to break the contract and Rest has been served with an eviction summons. While Rest is seeking to defend itself in the high court, it has become apparent that no matter the outcome, it must find a new home that will enable their pangolins to forage naturally and where Rest can continue monitoring them and continue its groundbreaking work. If Rest does not receive enough funds it will have no choice but to close down. 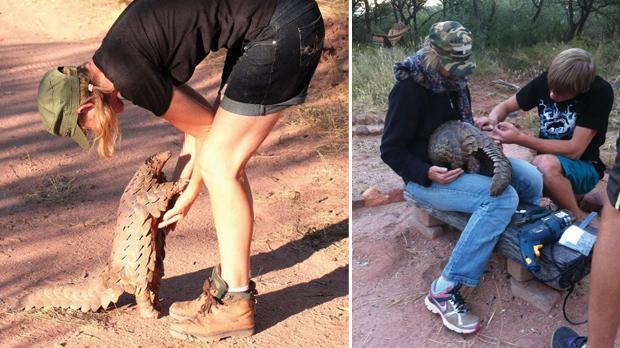 For this reason it launched The 50 Club on World Pangolin Day 2015 on February 21. It needs 17,000 people to donate (€47) each, although it appreciates any donation received. “With this money, Rest will be able to purchase its own property, develop it and have a permanent home for all its species,” Diekmann said. Readers who would like to form part of the campaign and donate may visit the website below.